The Town of Banff incorporated as a municipality in 1990 and was the first municipality in Canada to be incorporated inside a national park. The only other national park community in Canada is the Municipality of Jasper, in Jasper National Park, incorporated in 2001. The Banff townsite covers 3.93 square kilometres (2.5 square miles) and has an elevation of 1,383 metres (4,537 feet) making it the highest town in Canada. Banff's townsite boundaries are fixed by federal law. The municipality may not expand its land base. The Town of Banff is located inside Banff National Park, Canada’s first and the world's third national park, established in 1885. The park itself is 6,641 square kilometres (2,564 square miles); 96 percent of the park is wilderness. Banff National Park is one of four adjacent national parks designated as the Canadian Rocky Mountain Parks UNESCO World Heritage Site. Banff National National Park was declared a UNESCO World Heritage Site in 1984. The Town of Banff has approx. 8,000 residents. Check out the municipal census for details. Living in Banff is a privilege and we all know how lucky we are to be part of this community inside a national park. Our Way of Life is more than just skiing and hiking (but there is a lot of that), it's also taking care of this special community and respecting our surroundings. Everyone that lives in Banff must meet a “need to reside” requirement regulated by the federal government. Tourism is the town’s economic driver. More than three million people visit Banff National Park every year, and almost all of them visit the Town of Banff. The federal government limits the amount of space available for commercial development in national parks. 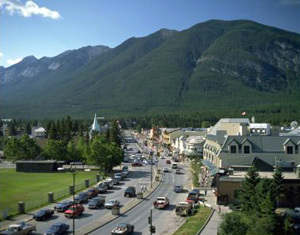 Commercial space in the Town of Banff is capped at 353,000 square metres (3.8 million square feet), or about 10% of the total area of the townsite. Commercial activities must be consistent with the purposes of the town as set out in the Banff Incorporation Agreement. Find out more about opening a business in Banff. The Town of Banff is governed by a mayor and six councillors under The Municipal Government Act of the Province of Alberta. A municipal election is held every four years.